A herniated disc is a condition that can strike any part of the spine, but is most common in the lower back (lumbar spine) or neck (cervical spine). The spine is made up of a column of stacked bones called vertebrae. The vertebrae are separated by flat, gelatinous discs that provide cushioning between the bones. The discs are made of a tough outer layer, called the annulus fibrosis, and a jelly-type center, called the nucleus pulposus. Over time, the disc begins to deteriorate, most commonly by drying out and shrinking. When this happens, the disc’s outer wall can become weak and tear (herniate), allowing the disc’s center to push out onto very sensitive spinal nerves, leading to pain and irritation. 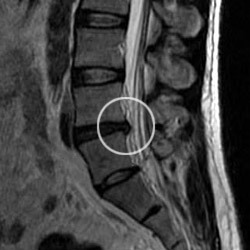 A bulging disc occurs when the outer layer remains intact but bulges outward, pressing against nerves. A herniated lumbar disc is one of the most common causes of low back pain, primarily because the lower back bears the majority of the body’s weight. Pain that worsens with lifting, bending, standing or sitting. If conservative treatments fail to provide adequate pain relief or a patient continues to suffer from loss of function, especially nerve damage, Dr. Singh may recommend spinal surgery to repair the herniated or bulging disc in the lower back. Recent studies by the National Institute of Health show that surgical intervention leads to improved clinical outcomes when compared to non-surgical treatments for herniated lumbar discs.